She Phobos (Greagish: Φόβος) y fo-phlannad sthie as by moo jeh chooid Mart (she Deimos y fer elley). Ta cowrey corysagh Mars I currit er myrgeddin. Va Phobos feddynit magh er 12 Luanistyn, 1877 ec Asaph Hall. Hooar Hall Deimos magh ec y traa cheddin. ↑ Planetary Satellite Physical Parameters. JPL (Solar System Dynamics) (13-Jerrey Souree-2006). Feddynit er 29-01-2008. ↑ Classic Satellites of the Solar System. Observatorio ARVAL. Feddynit er 28-09-2007. 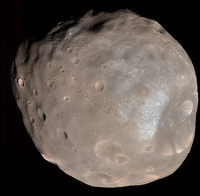 Ta tooilley coadanyn mychione Phobos ry-gheddyn ayns Wikimedia Commons.